Gerhard Andersson is the most highly renowned psychologist at LiU and winner of the Nordic Medical Prize. He has double doctoral degrees and a publication list with over 500 scientific articles and 18 books. 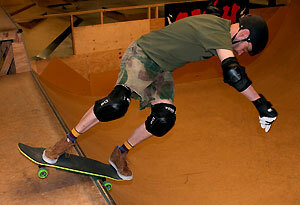 But in the skateboard hall, all that counts for nothing. Today, anything is just a click away. And once he had the board, Gerhard found the path to the skateboard hall in Norrköping easy to tread. Rather shaky to start with, more worried about injury, and now completely legal. And just as much fun as it used to be. Gerhard Andersson feels that the skating world is more obsessed with gadgets now, and tells us proudly about the board he designed himself, manufactured by his friend Tony Hesse. Gerhard Andersson’s revived interest led him back into closer contact with his old skateboarding pals, Mikael Nyqvist and Tony Hesse. 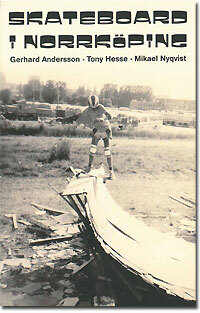 They decided to write a book together, and “Skateboard i Norrköping” is the result, which they have self-published. It starts with Norrköping and their memories from the town. But skateboarding as a phenomenon was, and is, pretty much the same throughout Sweden. “We discuss different places, gadgets and epochs. We describe events and share memories from various periods,” is what it says in the dustjacket text. Previous and current skateboarders have been interviewed and the result is an imposing piece of research. The book also contains many photographs. “There was a guy back then who took loads of photos. And amazingly enough he had saved them all. We also received photos from other people, and we ended up with more than 400. About a hundred of these are in the book,” says Gerhard. While researching the book Gerhard Andersson came to the conclusion that skateboarding has not been a particularly popular topic for research. Maybe there’s a potential here for a new research field...?